Nikola Vlasic is one of the many benefactors of Russia’s post-World Cup boom. In the latest Transfermarkt evaluation, the Russian Premier Liga made a jump from €877.4 million to €920.53 million. The average market value of players in the Russian Premier Liga jumped from €1.5 million at the end of the 2017/18 season to €2.23 million halfway through the 2018/19 season. Among the biggest winners of the latest evaluation by Transfermarkt were CSKA Moscow. Although the club sold Aleksandr Golovin to AS Monaco during the summer transfer window the club’s overall transfer value increased from €96.03 million at the end of the 2017/18 season to €137.2 million halfway through the current season. The growth of the club’s overall transfer value is remarkable given that the club had to undergo a major rebuild after several key players left the team in the summer of 2018. Watch the English Premier League live. Book your custom European football travel tour by visiting Nickes.com! But CSKA have had a brilliant summer on the transfer market. Except Abel Hernandez, all of CSKA Moscow’s new signings this summer saw a significant increase in their transfer values in the latest Transfermarkt update. The biggest winners? Nikola Vlasic, from €8 million to €18 million, Ilzat Akhmetov, from €1 million to €6 million, Hördur Magnússon, from €1.5 million to €6 million, and Rodrigo Becão from €1 million to €6.5 million. Furthermore, the already established Mário Fernandes saw his transfer value increase from €20 million to €26 million. Born in Brazil but a Russian national team player Mario Fernandes is now the most valuable player in the Russian Premier Liga. 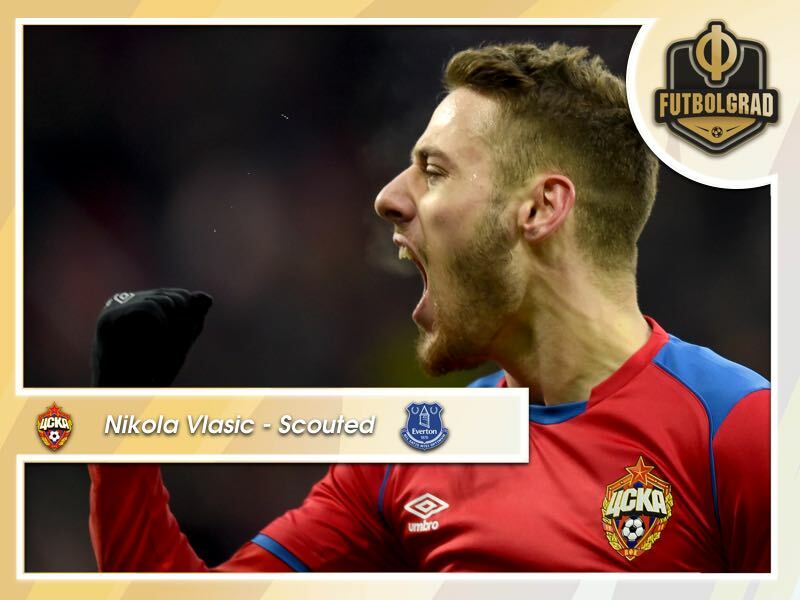 The most remarkable increase in transfer value is that of Everton’s loanee Nikola Vlasic. The 21-year-old Croatian midfielder was loaned out by Everton to CSKA Moscow this summer with the hope of more playing time. Playing time that the Croatian received both in the RPL but also in the UEFA Champions League. With an average rating of 7.46 on Whoscored Vlasic, is the highest rated RPL player this season just ahead of Zenit midfielder Leandro Paredes. A dominant playmaker for CSKA it was thanks to his loan deal that head coach Viktor Goncharenko had no problem replacing the talented Golovin, and despite a somewhat difficult start CSKA are now just four points behind league leaders Zenit St. Petersburg in the RPL standings. Vlasic’s contribution can easily be measured. The 21-year-old has scored four goals and two assists in 14 RPL games this season. He was also prolific in the UEFA Champions League, where CSKA finished fourth in the group stage despite beating Real Madrid twice. Here Vlasic has scored three goals and two assists in six Champions League group stage matches. The brother of the famous Croatian high jumper Blanka Vlasic Nikola stems from a family of athletes. While his sister holds several records and has successfully competed at various tournaments around the world, their father Josko Vlasic was an international athlete, who broke the Croatian record in the decathlon. Their mother Verena, in the meantime, played basketball and competed in amateur cross-country skiing events. Athleticism then is what stands out the most when one watches Nikola Vlasic compete for CSKA Moscow this season. It is athleticism that allows the Croatian national team player to occupy various positions in Goncharenko’s preferred 3-5-2 setup. Vlasic has played as a holding midfielder, attacking midfielder and even on the wing under the Belarusian head coach. The ability to adapt to Goncharenko’s tactical demands is what has made Vlasic a standout player in the RPL. In fact, as the Transfermarkt numbers highlight Goncharenko, in particular, is the key to Vlasic’s development this season. Many at CSKA predicted a difficult season, but the 41-year-old Belarusian coach dealt well with the transition period and not only signed the right players but also made the players that were signed better. That was exactly what Everton were hoping for when Vlasic was sent on loan to CSKA this summer. Improvement by a player, who was signed by Everton from Hajduk Split in the summer of 2017. But making the jump from Croatia to England can be tough for a young player – especially to a club that somewhat struggled to find an identity on the pitch throughout the 2017/18 season. Hence, a loan deal was arranged, and six months later many CSKA fans would love to make the deal permanent. It is, however, a catch-22 for CSKA. Vlasic has been without a doubt the club’s best performer this season, which in turn makes him an interesting proposition for Everton’s manager Marco Silva. For CSKA in the RPL Vlasic has mostly operated in the space between halfway line and the penalty box. Liking to drift to the left Vlasic manages 82.36 actions a game of which he completes 56.9%. The Croatian has a fantastic shot and manages to get 23.9% of his on average 2.64 shots on target. Impressive are also his ability to complete 80.1% of his on average 37.01 passes despite playing high up the field and many of his plays being played through the channel. Vlasic’s most remarkable stat, however, is dribblings and duels. The attacking midfielder on average completes 85.6% of his on average 8.19 dribbles and also averages 30.14 duels per game of which he wins 45.4%. Vlasic’s numbers do not drop much in the six Champions League games he played for CSKA this season. Here Vlasic has managed to complete 59% of his on average 75.26 actions. In fact, he managed to get 53.2% of his on average 2.35 shots on target and completed 83.7% of his on average 33.55 passes per game. His dribble numbers were slightly lower in the UCL as they dropped to 6.59 on average – he managed to complete 80.9% of his dribble attempts, however. When it comes to duels his average only slightly dropped from those in the RPL to 29.79 of which he won 42.1%. The Champions League numbers, in particular, highlight that Vlasic has made a big step forward in his development from last season. Vlasic – What does the future hold? Earlier this year the Russian online portal Sports.ru argued that the club should do anything in its power to keep Nikola Vlasic in Moscow. “Any communication with [Everton] is informal at the moment. But for us, the most important part is Nikola’s position. He would very much like to stay at CSKA,” CSKA’s CEO Roman Babaev told Sports.ru in an interview on December 24. “We understand that there are many clubs that would buy Vlasic right now. But until the summer the rental deal protects us. We will talk to them but business is business and if they receive a good offer why would they choose CSKA over another club? So the story is not easy,” Babaev said. “It is obviously, unlikely that CSKA can pay the amount that is discussed in the press at the moment,” Babaev added. “Everton paid €11 million for Vlasic. They need at least that money to recapture the transfer. Furthermore, Nikola receives a lot of attention,” Babaev concluded. Overall, the CSKA CEO does not believe that a transfer of over €15 million would be possible for CSKA. CSKA, in particular, is dependent on making a profit on the transfer market, which means that to make Vlasic a permanent transfer it would have to come at a price that CSKA could recuperate in the future. Given the recent transfer evaluation of Nikola Vlasic, however, it seems unlikely that Everton would be willing to let the Croatian go under market value. Furthermore, the Toffees understand the market and midfielders like Vlasic could earn the club a pretty penny should they choose to sell him on. Whether they will sell him is another matter entirely of course. Given his performances, there is a good chance, in fact, that Vlasic could play a good role at Everton in the coming season.